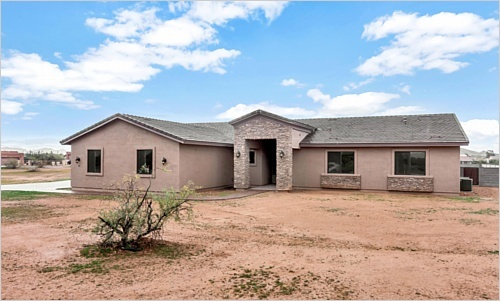 Stunning BRAND NEW CUSTOM BUILT home on just over one acre of perfectly flat, usable land. This gorgeous property has an over-sized three car garage to take all your toys and more... DOUBLE RV GATES FRONT AND REAR with full easement access make this home perfect to enjoy your cars, RZRs, quads and much more. From the beautiful wrought iron front door to the gourmet kitchen and huge great room with solid wood beams, this home has touches of class all the way through... check out the photos!! All this directly opposite pristine undeveloped State land with clear views to the mountains beyond, this home has craftsmanship, location and practicality in one package! A simply perfect Desert Hills retreat! Bring your RV, Horses, and Toys!